Wayne Stephens and W.Stephens Cabinetry & Design Given Ft. Mitchell's Community Investment Award! Wayne Stephens and W.Stephens Cabinetry & Design Given Ft. Mitchell’s Community Investment Award! The City of Fort Mitchell recognized Wayne Stephens, Dr. Ryan Olexia, and Alex Edmondson with their first ever Community Investment Award on July 18th. The Ft. Mitchell Community Investment Award is given to people who have devoting significant time and resources to Ft. Mitchell. 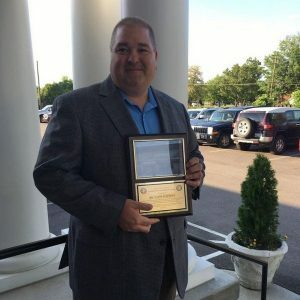 This award was given to Wayne Stephens for the role he had in revitalizing the building located at 2497 Dixie Highway (corner of Dixie Highway and Orphanage Road) and how it fosters the local business climate. It was built in 1940 and housed many different businesses over the years. Wayne Stephens and Alex Edmondson purchased the building in 2014. 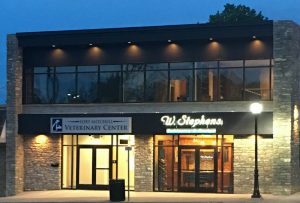 Currently the ground floor is occupied by W. Stephens Cabinetry & Design and Ft. Mitchell Veterinary Clinic. There is another 1,000 square feet on the first floor that will house a future business. The 2nd Floor is occupied by W. Stephens Cabinetry and Design.